Leslie Basham: Shannon Popkin recognizes a temptation she has when dealing with other people. Shannon Popkin: I have lunged after control in hundreds, maybe thousands, of ways. I can tell you that I have never been able to maintain control. It can’t be done—and really?—I just interject pain; I interject strife! Leslie: This is Revive Our Hearts with Nancy DeMoss Wolgemuth, author of Surrender, for Wednesday, September 27, 2017. Nancy DeMoss Wolgemuth: I love how the Lord puts together relationships and friendships through the ministry of Revive Our Hearts and True Woman. Shannon, I’ve heard about you for years and years from our good mutual friend, Debra Fehsenfeld. She was Deb Showers when you knew her in college. You have been writing for the True Woman blog for a number of years. A lot of our listeners have read you on the blog, and if they haven’t, they need to! I love the way you tell a story. I love the way you weave it into Scripture. And finally it’s about time that we’ve gotten you in the studio to talk about a new book. Shannon: Thanks so much, Nancy, it’s really fun to be here! Nancy: If our listeners have read any of your blog posts, they know that you are an energetic, vivacious, outgoing, storytelling, fun woman. I think people are going to really experience that and enjoy that as we talk over the next two or three days. You’ve written a book called Control Girl. Let’s just start with that title, before we say the subtitle. Control Girl! Your husband teased you about the fact that he should be in the acknowledgements. Why was that? Shannon: He said that without him I would just be going on in life thinking I was agreeable! I wouldn’t even realize I was a control girl. Nancy: So you were a control girl, and so this book is a little bit autobiographical? Has it come out of your journey at all? Shannon: Yes. I almost feel like the title’s a confession. Yes, definitely it’s coming from my story. But it’s something that you’ve experienced so much of your life, and yet you didn’t realize that you were a control girl. Let’s start: What is a control girl? Shannon: I think a control girl is somebody who wants to have and keep and maintain control. She feels like she can be in control, and she feels like it’s all up to her keep control of everything. She forgets that there is Somebody who already is in control—and He doesn’t really need her help! Nancy: Wow, well said. And yet, I think when we’re trying to . . . Somebody would look on and say, “You’re being a control girl,” but I’m thinking (maybe you’ve thought it), Well, I’m not really being controlling. I’m just trying to be helpful. I’m trying to make sure things don’t get way off the track. We tend to think of those behaviors—when we’re in the midst of them—as being helpful. Shannon: Yes. We have such good intentions. We’re only taking control because we care so much. We love these people, so we’re trying to invest in them and we’re trying to control the outcomes. We just control because we love them, we care. We are invested in these situations that we are involved in, and we don’t necessarily see it as a negative thing that we’re taking control. Shannon: Absolutely! Yes, I wanted control in my relationship with my parents; I didn’t want to submit to their authority. In friendships I wanted to manage things and manipulate things. Also in dating and all the different stages of life. But I would have never labeled myself as controlling. Shannon: Um, yes, I have. Nancy: I have as well, and I’m thinking, Well, what’s wrong with things being done right? Nancy: So you didn’t think of yourself as a controlling woman—a “control freak,” sometimes you’ll hear that term. By the way, I’ve got the book in my hand, and I want to just hold it up here so that people know what we’re talking about. If they’d like to get a copy of this book—maybe for somebody else they know who has an issue with this . . . But, Control Girl, and the subtitle is: Lessons on Surrendering Your Burden of Control (we’re going to talk about that in a moment) from Seven Women in the Bible. So you take these seven women in the Bible—who have more similarities to us in more ways that we might realize—and you pick out some lessons from them that have helped you and can help us when it comes to surrendering this burden of control. By looking into their lives from God’s perspective that He gives us in the Bible, we can learn something about ourselves, and we can gain God’s perspective on our own control issues. Nancy: We were talking over lunch, just before this recording, that there was no shortage of women to choose from in the Scripture. You chose seven. I think they’re all Old Testament women, aren’t they? Shannon: They are. Yes, I got to Numbers and I was out of space, so we could have kept going. Nancy: And God tells us in the New Testament that these things were written in the Old Testament as examples for us that we might learn from them, that we might not fall into some of the same traps that they did. There’s much more that can be said about each of these women. A whole book could be written on each one. Nancy: But you’re doing it through the lens of women who tried, in different ways, to control their circumstances, their lives, the people around them, and some of what they ran into in the process of doing that. Shannon: Yed. There are so many warnings as we look at their lives; there are so many lessons. There are so many, like you said, mistakes to avoid and just new insights about ourselves and about God that we can learn by looking at their control issues and considering our own. Nancy: But also, ways that God redeemed those women and changed them and brought them to a place of surrender, which—as we’re going to see—is the antidote, the cure, for dealing with these control issues. So, I love the example of these women. I love teaching women of the Bible, myself, so I love how you’ve done this in this book. But you start with your own journey, because that’s what got you interested in exploring the lives of these women. When—and how—did you first start to realize that . . . maybe . . . control was an issue in your life? Shannon: Before I was married, I don’t think I realized that I had control issues. I think because I could manage my little life the way I wanted. I was a teacher, and I would come home after work, and I would take a nap (I loved taking a little nap! ), and then I’d eat a little snack for dinner, and then I would go out. I was really, really social. I was in Bible studies, and I was a youth leader, and I’d meet friends for coffee. And if you needed somebody to stay out until one in the morning and talk with you, I was your girl, because, you know, I had my nap coming up the next day! Right? And then, after I met my husband, it was my first time of trying to kind of give up some of that control. I would schedule our dates (or our weekends)—top to bottom—with social activities. He worked out of town and would only be in our town every other weekend, and so I would pack it full. And I thought, What!? Can there be enough of socialization? And so he proposed a one-night-per-weekend social calendar—and that was new to me. Nancy: So he just was really wired differently and wasn’t as energized by being out with people as you were. Shannon: He was drained by it, yes. And so, he was willing to compromise on his end, but he was asking me to as well. I was still starry-eyed and enamored with him, and so I just decided to do more without him, socially. But then when we got married, well, it was really complicating things. Aas a new wife, I wanted to have dinner on the table, but I couldn’t have our dinner ready and still take a nap . . . so I had to give up my nap! Shannon: Oh my goodness! And then I couldn’t stay out late, and it was just cramping my style. Nancy: And as you made those adjustments, it began to affect your attitude toward your husband and to have some negative effect on your relationship. Shannon: Yes. I was sort of resentful, and I was frustrated. Now that I had him—I loved him!—but I was trying to “fix” him, because I thought the problem was him. There’s one night that stands out in our early marriage, where I was really frustrated with him and feeling like I needed to control him. We had been invited out to dinner by some neighbors, to go to their house for dinner, and I was so excited. Nancy: You got your social fix. Shannon: We were new in the area, and I was so concerned about making new friends. We didn’t know anybody. We’d just started at our new church. So we went to their house and enjoyed this wonderful dinner. Let me back up and say that my husband, at this point, was building his career. He gets up really early in the morning—four-thirty in the morning. Nancy: Okay, my husband does, too. And that may explain why your husband wasn’t so excited about late nights out with friends! Shannon: This is true. He was exhausted by Friday nights. He’d put out a lot that week, and so he was ready to wind down. After dinner, when we went into the living room, we’re having this wonderful engaging conversation. I looked down at my husband, and he’s kind of sitting on the floor next to me, patting the neighbors’ dog. And when I looked down, I noticed that his hand was kind was just kind of limp on the dog’s back. I noticed that his head was at a strange angle, and I thought, Oh, no! I think he’s asleep. So I just tried to start talking and being even more animated so that I could keep their attention. I thought maybe they would just glance at him and think he was oddly, strangely staring at their dog, but I tried to keep all the focus on me. But then somebody asked him a question, and I nudged him with my foot and, of course, he kind of went, “Uh . . . gurgle . . . gulp . . .” and said something unintelligible. This beautiful evening with our new neighbors came to this screeching halt. They said, “Oh, you must be exhausted!” and they ushered us to the door. And so, between their driveway and our driveway—which is about five driveways—I packed a lot in! Nancy: That was early in your marriage, so as you continued to add children and other complexities of responsibilities—and whatever—it got more complicated. Shannon: Yes. When I was single, I just had my own safety and my own appearance, my own behavior to control. Well, now I had five people whose safety and appearance and behavior I was trying to control . . . everybody! My control issues were just mushrooming under just this normal strain of family life. Shannon: Yes. I had this ideal for what my family should be like: the kids should be well-behaved; we should all look cute, adorable. I wanted everyone to like my family. I wanted us to fit well into the groups that we were engaging in—at church or playgroups or wherever. So I was trying to control all that. Nancy: And how successful were you? Shannon: You know, I have lunged after control in hundreds, maybe thousands, of ways. I can tell you that I’ve never been able to maintain control. I’ve never been able to create this happy ending that I have in mind. I’m never able to keep everyone safe and happy. It can’t be done—and really?—when I try to take control, I just interject pain. I interject strife. I interject misery. I sabotage my own idea of a happy ending by trying to control it. Nancy: And that misery probably goes two directions: one, internal . . . what it does to you (and I want to talk about that in a moment), but also, what it does to those around you. So what’s happening inside of you as you’re trying to wrestle control of your circumstances? Shannon: Frustration, anger, tension. And, of course, that’s feeding into all of my relationships with my children with frustration and tension; in my marriage with frustration and tension. Now, for me, this was an “in-house” operation. I didn’t let this seep out into other relationships; it was pretty private for me. But there was a lot of tension in our home. I’m talking as though this is in the past . . . I’m a recovering control girl! But when there is tension, when there is strife, when other people are pulling back from relationships or when they’re getting frustrated, I think my advice would be, “Look if you’re trying to control where you shouldn’t be controlling.” For me, I wish I had looked there sooner. Nancy: You bought your little child, who was at the time maybe a two-year-old, a video control. What do you call that thing? Shannon: A video game controller. Nancy: A video-game controller—thank you!—when he was a little guy. Except, it didn’t work. Why did you do that? Shannon: That’s right. So he’s pushing the buttons, and he’s completely content watching the screen. Nancy: He's thinking he’s making a difference. Shannon: Yes, he's thinking that he’s in control. And isn’t that such a good picture of us sometimes? Because as we see life playing out in three-dimension around us, we feel like we’re the ones in control. We feel like that we can control. In fact, we feel like it’s all up to us to take control. It feels like the good and right thing to do. Shannon: It is an illusion. We don’t have control. But it’s also an invitation in those moments when you recognize you’re not in control. Maybe it’s when you get the word about the cancer, or you find about your husband’s unfaithfulness, or you find the suicide note or the drugs, or whatever it is. Nancy: Or a child is acting out in a way that you can’t control. Nancy: I get so stuck in the things that need to be fixed, and then I’m helpless to change myself, certainly helpless to change others around me without the grace of God. And yet, we would say theologically (those of us who have been around this teaching any length of time), “I know God’s in control. I know God’s in charge. I know He’s sovereign (big theological word), so why do we live like we have to fix it all? And then when we sang songs about it; we heard it in the sermon, and then that day I walked out into the parking lot and I began trying to control my children! I remember, on the way home from church that day, my son was talking about the fact that he didn’t want to go to our youth group anymore. He wanted to go to a different youth group. And so, oooh, my control girl just kicked right in. Even though I had spent the entire morning affirming that God is in control and I am not. Why do we do that? I think we’re not convinced that’s a good thing. I think maybe we believe it cerebrally, but we’re not convinced that it’s good that God is in control and it’s good that we’re not in control. I think, then, that that’s just evidence that we don’t believe in God’s goodness. We don’t truly believe in His faithfulness. We’re not assured of His care for us, and that He sees us and knows us and that He is intricately involved in the details of our lives. I think those are the things we need to remind ourselves of in order to surrender control. Nancy: And maybe we don’t think He would resolve it quite the way we think it needs to be resolved . . . which, how arrogant is that when you think about it?—that my way would be better than God’s!? Shannon: It is, and well, I think we’re shortsighted sometimes. I just want to take care of my little life, my little happy ending, and God has such a bigger, broader, more infinitely glorious perspective of my life. It’s a story that He’s writing, and it’s all about Him. It’s not about me. And when I try to hijack it and make it all about me and my little story and my happy ending, well that’s when I’m not willing to surrender the things that I hold onto. I don’t want to surrender those to His greater purposes. So, you’re right, it’s arrogance. Nancy: You’re not saying, “Let the kids do whatever they want to do; you’re not to parent.” There’s a balance there, right? Shannon: There is. I think good moms do control their children, but as they age—as they progress towards adulthood—we need to start giving up control, right? Nancy: Even when they’re little, though, you can’t really control the outcome of their lives, their health, their safety. You realize, you’re not God, right? Shannon: Absolutely! I mean, you can buckle them into that carseat, you can keep them germ-free, but ultimately, we’re not in control. I think the sooner we recognize that, the better. Nancy: So how does surrender relieve us of the burden of trying to control the whole world? Shannon: I think surrender is the antidote. Surrender is just recognizing, “God is in control,” and He’s so much better at it than I could ever possibly be. Nancy: So, it’s a faith-walk really. I'm trusting that God is watching, that He is there, that He’s got the whole world in His hands, that He knows how to deal with these issues and these challenges. I'm trusting that He will show me how to act and not to act in that situatio, and then being willing to wait on God to do something that I think needs to be fixed or changed now. And that may not be the way He wants to write the script. Shannon: Absolutely, surrendering to His timeline, to what He says is good, to what He is doing in the future that I can’t see and I don’t know about. All of those ways are the antidote to me becoming a control girl. 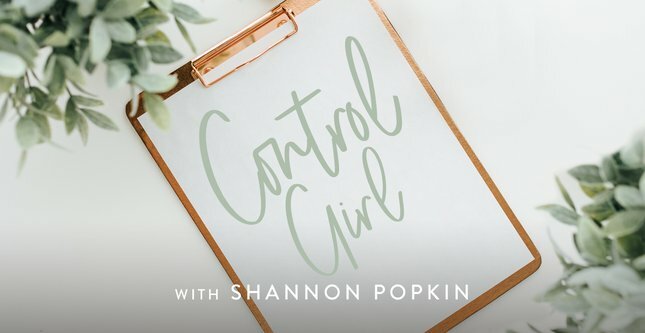 Leslie: Nancy DeMoss Wolgemuth has been talking with Shannon Popkin, author of the book Control Girl. Like Nancy’s been telling you, we’d like to send you that book when you support Revive Our Hearts with a gift of any amount. Your gift will help us continue providing practical conversations like this one, based on God’s Word. Call us at 1–800–569–5959 and ask for Control Girl, or visit ReviveOurHearts.com. Our team has recorded a video with Shannon Popkin talking about these issues of control vs. faith in God. And you can see that video at ReviveOurHearts.com, and then share it with someone else. Tomorrow, Shannon will be back to tell us about some times when it was difficult to surrender control to the Lord. Please be back for Revive Our Hearts.